After the Chris Jericho vs. Edge match, the cameras backstage come to life and capture the image of Renee Young standing side by side with The Great White, Sheamus! There's a roar throughout the arena as Sheamus sports a smile, nodding his head up and down. Listen to them out there, would yah! Renee laughs as she brings the microphone to her lips. Sheamus, last week you made your debut here in the AWO by claiming that no man on the roster could beat you. You were then challenged by none other than Ric Flair to a match on tonight's show. But then Flair himself was challenged by The World's Strongest Man, Mark Henry. And as I look at tonight's card, I see that the general manager has decided to go with Flair vs. Henry as the main event instead of you vs. Flair. Ha ha, the general manager decided? I don't think so, Renee. I'm sure that Flair was asked which man he would like to face, myself or Mark. And granted, Mark himself isn't exactly a walk in the park. But let's be honest here, he's no Sheamus! The fact of the matter is that The 'Nature Boy' is scared of me. You saw it last week when he ran away from the ring, scared to face me one on one. And you're seeing it again this week, as I'm stuck against some nobody while he's in the main event, locking arms with Sexual Chocolate. I'll tell you what, Nature Boy. You can't run from me forever, and you won't. Because I've already talked to Mr. Bischoff, and next week, down in that ring, it's going to be you and I, one on one. You won't be able to escape this time, Flair. I'm going to kick your arse, and show you how a real man fights! Sheamus looks down at Young and smiles, letting out a soft laugh. Now if you'll excuse me, I've got some business to take care of! The Celtic Warrior flashes his pearly whites one last time before walking off of the set, Seth Rollins in his sights. Sheamus....you're in the AWO for a minute and you act like you have it all. Well I've got some sour news for you! You were nothing in the WWE and you're nothing here! I came out last week to take you up on your challenge, but unfortunately Mark Henry decided he wanted to try and be. the. man! So after tonight, when I go out there and defeat Mark, I'm going to set my sights on you, Sheamus! You may be bigger. You may be stronger. But when you step between those ropes with The Nature Boy, you will be put through hell! I will pick you apart piece by PIECE, AND I WILL LEAVE YOU IN THE RING, WITH EVERY PART OF YOU BODY ACHING!! WOO! I'M GOING TO LOCK IN THE FIGURE FOUR I'M GOING TO PICK YOU STRAIGHT UP AND DROP YOU DOWN WITH THE PILEDIVER I'M GOING TO GIVE YOU THE WORST LOW BLOW YOU'VE EVER SEEN AND I'M GOING TO CLIMB UP HIGH AND DROP MY KNEES STRAIGHT INTO YOUR CHEST WOOO!! SHEAMUS....you better watch your back because the Nature Boy is coming for you. We return from commercial break to find Sheamus relentlessly pounding on Seth Rollins in the corner. Shot after shot are connected to Seth's face, the fans split on who to cheer for. Sheamus grabs Seth's arm and launches him into the opposite corner, rushing at him and landing a massive clothesline. The fans pop as The Great White tries for a cover. 1 . . . 2 NO! Rollins still has some fight in him. Sheamus takes a deep breath, not knowing what he has to do to beat this man. He then rises to his feet, looking around the arena and nodding his head. He pounds his chest once, the crowd joining along with him. He does it again, backing up into the far corner. "Fella, Fella, Fella . . ." He continues to do this until Seth is up from the canvas. The unwary, unknowing, Seth turns around and is met with The Celtic Warrior's secret weapon, The Fella Kick! Rollins's head smacks off the mat and a loud thud echos throughout the complex. Before Sheamus can go for the pin and end the match however, The Nature Boy's theme music begins to play over the PA system, causing Sheamus to lose his focus. He makes his way over to the ropes and points up the ramp, calling out Flair's name. But there's not response. After a few moments, Sheamus realizes that this was all just a trick to throw him off his game, so he turns back to his opponent. It's to late however and Seth is back on his feet. Sheamus walks right into a nasty superkick, knocking him out cold. That's not enough for Rollins however, so he flips Sheamus over onto his stomach and backs up, measuring his pray . . .
Seth quickly, but cockily, flips Sheamus over and goes for the cover. 1 . . . 2 . . . 3! Rollins hops up to his feet and shoots his arms up into the air. His fans burst into a cheering frenzy, while Sheamus's marks are sat, quite and unhappy. Flair finally shows himself atop the stage, everyone joining together to send a massive amount of boos his way. Ric simply smiles, nodding his head up and down, staring at the still unconscious Sheamus. Seth pushes his hair back and points up at Flair, letting him know that they're far from allies. The Nature Boy doesn't care though, he did it for himself and no one else. The show fades out to commercial break as the referee tends to The Great White. Welcome back to Friday Fusion, JR alongside Jerry The King Lawler. With our main event picking up steam. The undefeated Mark Henry up against the undefeated Nature Boy Ric Flair. And Ric Flair better watch his back, JR! Mark Henry isn't the Worlds Strongest Man for nothing! Ric Flair is being thrown around by the massive Mark Henry, not able to mount an offense. Finally Henry picks Flair up and delivers the World's Strongest Slam! MY GAWD!! RIC FLAIR WILL NOT STAY DOWN! How much more punishment will Flair put himself through! Flair slowly gets to his feet as Henry becomes more intense and angry. As Henry came towards him, he gave him a poke in the eye, and drops him to the mat with a suplex. Flair starts stomping on Henry and gaining momentum. We Henry returns to his feet, he is meet with a back rake and stumbles into the turnbuckle. 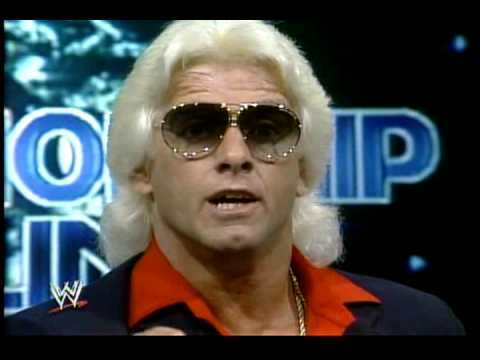 Flair starts hitting him with his signature chops as the crowd "WOO'S!" Henry falls to his feet and Flair begins to strut and prepare for the Figure Four. Right before he leans over to grab Henry's legs, Sheamus' music hits. Flair immediately turns toward the stage as Sheamus comes out looking towards Flair, as serious as can be. He waits a few seconds and takes a few steps. 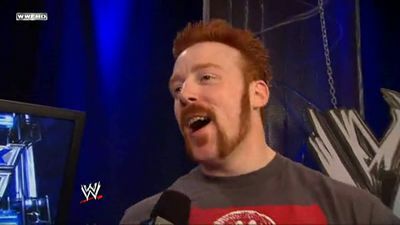 Sheamus then sports a grin, and starts to step back towards the stage exit. Sheamus beats his chest and lets out a loud "FELLA!!" before returning to the back. Flair turns back around to focus on Henry and is picked right up and dropped quick with the third Worlds Strongest Slam of the night! Flair rolls out of the ring after the pin fall and leans against the barrier looking furious at first. After around 10 seconds he begins to show a smirk as he realizes that he has another person to go head to head with, with dirty tactics. Very well written promo between the two of you. 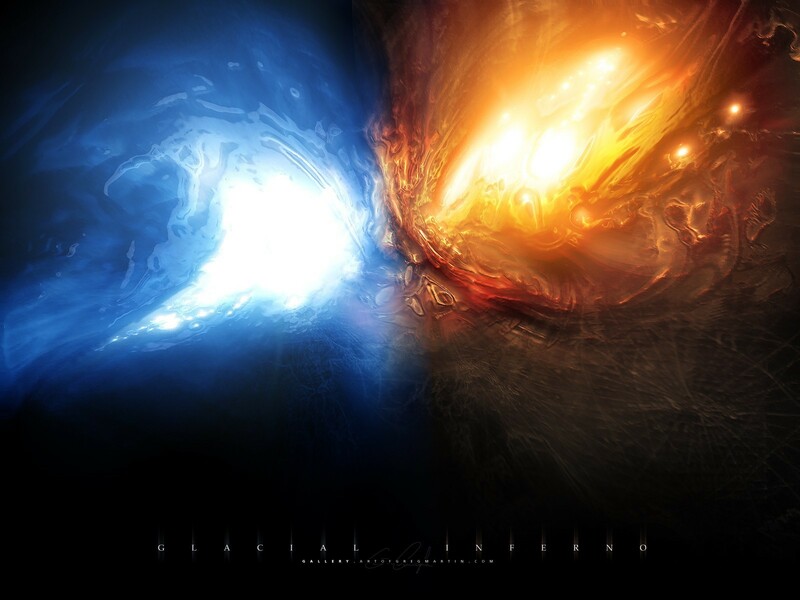 I like how it spanned over the course of the night, and it really started to develop a feud. Two big figures in this business putting on a promo clinic. Well done.